A high-performance airplane is defined as an airplane with an engine capable of developing more than 200 horsepower. A complex airplane is an airplane that has a retractable landing gear, flaps, and a controllable pitch propeller. In lieu of a controllable pitch propeller, the aircraft could also have an engine control system consisting of a digital computer and associated accessories for controlling the engine and the propeller. A seaplane would still be considered complex if it meets the description above except for having floats instead of a retractable landing gear system. Transition to a complex airplane, or a high-performance airplane, can be demanding for most pilots without previous experience. Increased performance and complexity both require additional planning, judgment, and piloting skills. Transition to these types of airplanes, therefore, should be accomplished in a systematic manner through a structured course of training administered by a qualified flight instructor. Figure 11-2. Coefficient of lift comparison for flap extended and retracted positions. Since an airfoil cannot have two different cambers at the same time, one of two things must be done. Either the airfoil can be a compromise, or a cruise airfoil can be combined with a device for increasing the camber of the airfoil for lowspeed flight. 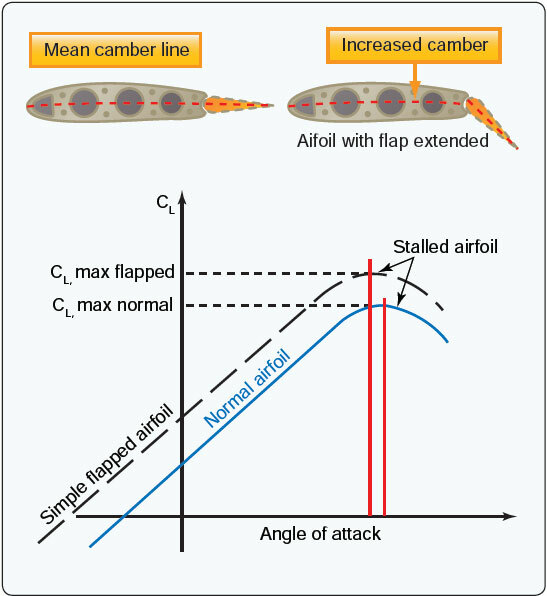 Camber is the asymmetry between the top and the bottom surfaces of an airfoil. One method for varying an airfoil’s camber is the addition of trailing-edge flaps. Engineers call these devices a high-lift system. As flaps are deflected, the aircraft may pitch nose up, nose down or have minimal changes in pitch attitude. Pitching moment is caused by the rearward movement of the wing’s center of pressure; however, that pitching behavior depends on several variables including flap type, wing position, downwash behavior, and horizontal tail location. Consequently, pitch behavior depends on the design features of the particular airplane. Flap deflection of up to 15° primarily produces lift with minimal increases in drag. Deflection beyond 15° produces a large increase in drag. Drag from flap deflection is parasite drag and, as such, is proportional to the square of the speed. Also, deflection beyond 15° produces a significant nose-up pitching moment in most high-wing airplanes because the resulting downwash increases the airflow over the horizontal tail. Figure 11-4. 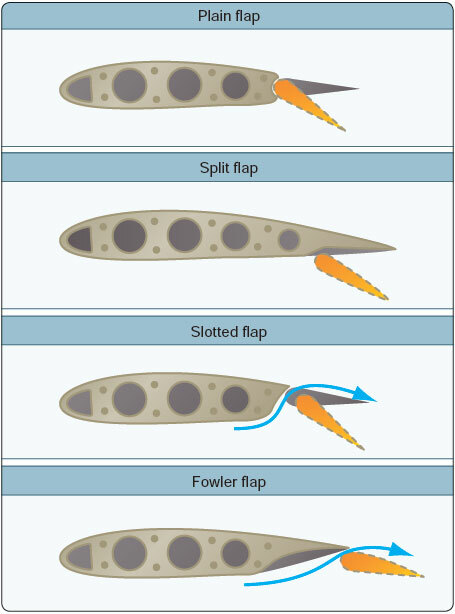 Four basic types of flaps. The plain or hinge flap is a hinged section of the wing. The structure and function are comparable to the other control surfaces—ailerons, rudder, and elevator. The split flap is more complex. It is the lower or underside portion of the wing; deflection of the flap leaves the upper trailing edge of the wing undisturbed. It is, however, more effective than the hinge flap because of greater lift and less pitching moment, but there is more drag. Split flaps are more useful for landing, but the partially deflected hinge flaps have the advantage in takeoff. The split flap has significant drag at small deflections, whereas the hinge flap does not because airflow remains “attached” to the flap. The slotted flap has a gap between the wing and the leading edge of the flap. The slot allows high-pressure airflow on the wing undersurface to energize the lower pressure over the top, thereby delaying flow separation. The slotted flap has greater lift than the hinge flap but less than the split flap; but, because of a higher lift-drag ratio, it gives better takeoff and climb performance. Small deflections of the slotted flap give a higher drag than the hinge flap but less than the split. This allows the slotted flap to be used for takeoff. The Fowler flap deflects down and aft to increase the wing area. This flap can be multi-slotted making it the most complex of the trailing-edge systems. This system does, however, give the maximum lift coefficient. Drag characteristics at small deflections are much like the slotted flap. Fowler flaps are most commonly used on larger airplanes because of their structural complexity and difficulty in sealing the slots.